The 2 stroke engine performs all the same steps which are performed by 4 stroke engine – suction, compression, expansion & exhaust; but the 2 stroke engine performs these all steps in only 2 stroke unlike the 4 stroke engine which completes one power cycle in 4 strokes. You might wanna know How 4 stroke engines work ? Counterweight – Counterweight on crankshaft is used to reduce the vibrations due to imbalances in the rotating assembly. Inlet & Outlet ports – It allows to enter fresh air with fuel & to exit the spent air-fuel mixture from the cylinder. 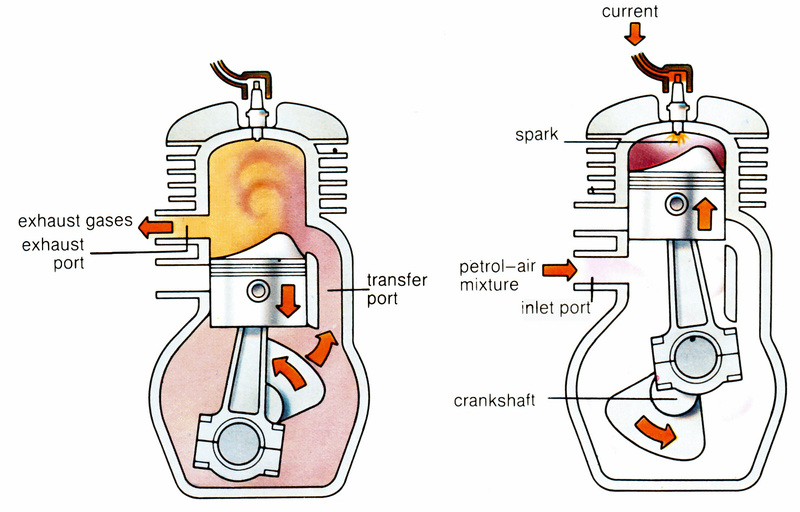 Two strokes get completed along with one power cycle. From the 2nd down stroke onwards the exhaust gases get expelled out from one side while a fresh mixture enters into the combustion chamber simultaneously due to partial vacuum created in the combustion chamber after removal of exhaust gases. This is the beauty of the engine. Both things happen at the same time which makes it a 2 stroke engine. Know What are the differences, advantages & disadvantages of 4 stroke & 2 stroke engine ! The above pic shows another variant of the 2 stroke engine in which the inlet & outlet ports on the same side. Here, there is no need to open inlet ports intermediately. The cylinder head is designed such that the exhaust port is closed during combustion & opens after combustion. The piston itself closes & opens the port accordingly. The process remains the same, difference here is just the design. You might have observed a protrusion on the surface of piston. This design helps the exhaust gases to flow through exhaust port easily giving it a direction. As the crankcase is sucking air-fuel mixture continuously, it is practically impossible to lubricate the piston & connecting rod. 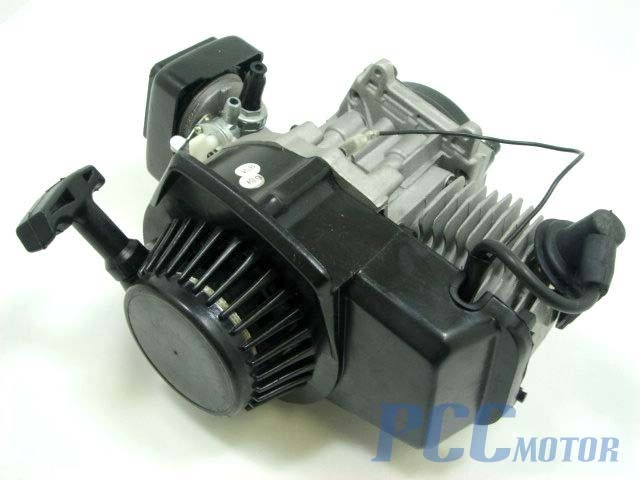 Therefore the fuel has to be mixed with oil or lubricant(2%-5%) in 2 stroke engine. Suggested Article :- How do Wankel engines work ? What force pushes the piston back into the compression strock——flywheel?